has joined the black and brown. but burnt, it stinks to heaven. when more covers the graves. till the hair dissolves your corpse. regneten auf die Welt hinab. unter die schwarzen und die braunen. die zum Himmel stinken, wenn man sie verbrennt. wenn neue Haare die Gräber bedecken. bis Haare deine Leiche zersetzen. Predstav si prvé chumáče, ako ti mäkko dopadajú na tvár,. prasačie chvostíky, konské chvosty, parochne. ale spálené smrdia do neba. až kým vlasy nerozložia tvoje telo. nežno padaju na vaše lice. kada ih zapalite, smrad se diže do neba. dok vam leš ne istrune pod njom. Matthew Sweeney was born in Donegal, Ireland in 1952. He moved to London in 1973 and studied at the Polytechnic of North London and the University of Freiburg. His poetry collections include “A Dream of Maps” (1981), “A Round House” (1983), “Blue Shoes” (1989), “Cacti” (1992), “The Bridal Suite” (1997) and “A Smell of Fish” (2000), “Sanctuary” (2004). Selected Poems, representing the best of ten books and twenty years' work, was published in 2002. Sweeney won a Cholmondeley Award in 1987 and an Arts Council Writers' Award in 1999. He has also published poetry and novels for children. His work is increasingly appearing in translation. Matthew Sweeney has held residencies at the University of East Anglia and the South Bank Centre in London, and was Poet in Residence at the National Library for the Blind as part of the 'Poetry Places' scheme run by the Poetry Society in London. 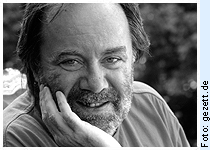 Matthew Sweeney died of motor neurone disease in 2018. Ausgewählt, übersetzt und mit einem Nachwort herausgegeben von Jan Wagner. Englisch-Deutsch. Übersetzt von Jan Wagner. Poetry International Web presents poems of Matthew Sweeney in original and english translations and further information about the poet.